Who doesn't love a light, fluffy cupcake? I wanted to make a "Shirley Temple" cupcake using 7Up, but didn't want it to be heavy like the typical 7Up pound cake. So, after some experimenting and trying to come up with my own "from scratch" recipe, I failed miserably. Nothing could keep moist and light and fluffy. Finally, I turned to a cake mix as a base. If you work with a boxed cake mix it can come out so entirely different than what it suggests on the box. I was going to go all "jell-o poke cake style and prick them and pour in some grenadine, but I decided to just add it to some of the batter and put it at the bottom. 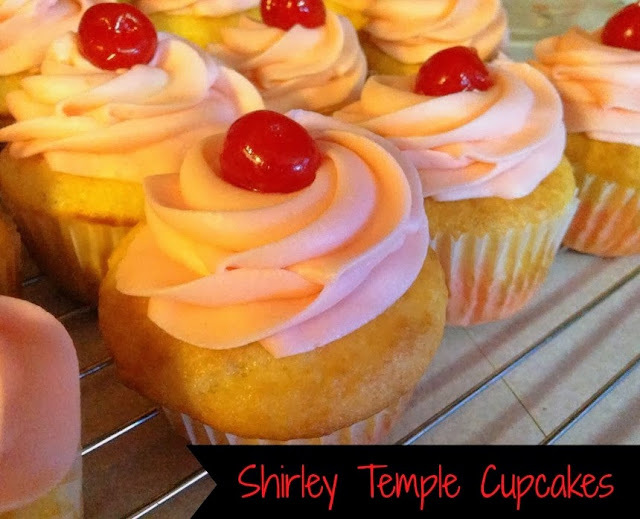 I was super happy with the results, and these are my winning Shirley Temple cupcake recipe...for now. Mix together the cake mix, oil and eggs. Pour in the 7Up slowly and mix until combined. Measure 1 1/2 cups of the batter and put in a separate bowl. Add the grenadine syrup to the batter you separated. Mix until it is combined. Fill the remaining 2/3rds of the cupcake liner with the plain batter. Bake for 12-14 minutes, until golden brown. In a mixing bowl, cream butter, mix it for 2-3 minutes to get fluffy. Add the powdered sugar, milk and cherry juice to reach your desired pink tint and cherry flavor. Keep beating the frosting until it is fluffy and holds a soft peak. Dry the maraschino cherries on paper towels to absorb the excess juice. 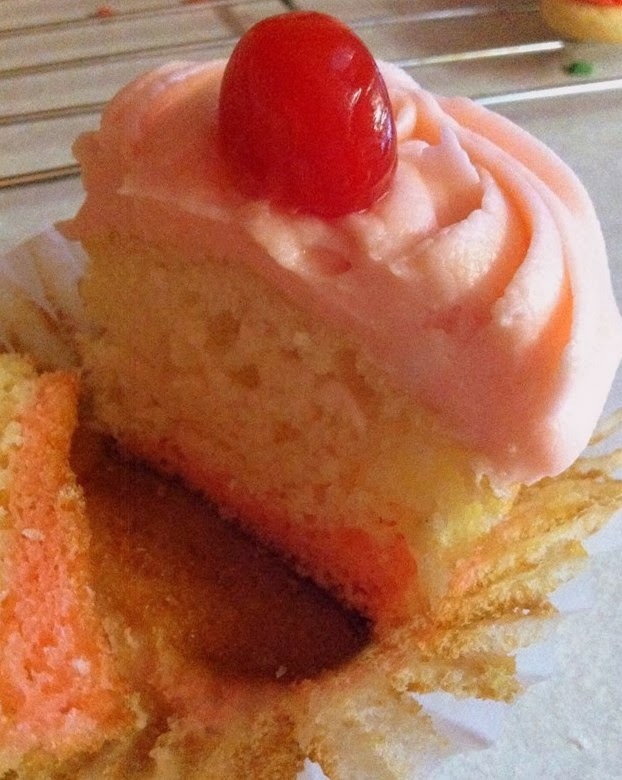 Garnish the cupcakes with a cherry on each, if desired.